And so did others locally who came and joined us in the Guide Hall, Tavistock today, Saturday 30th Jan. 2016 between 11:00 and 13:00. We had an open meeting to share ideas and link up local actions on climate change. We discussed what’s already going on and what else we might do. There was a lot of interest in learning, influencing, practical action and connecting with others. We’ll publish a summary shortly, and some suggestions for meeting up again. Thanks to everyone who came along and participated, to the folks who arranged it and helped make it happen … and to the Tavistock Times for their support. 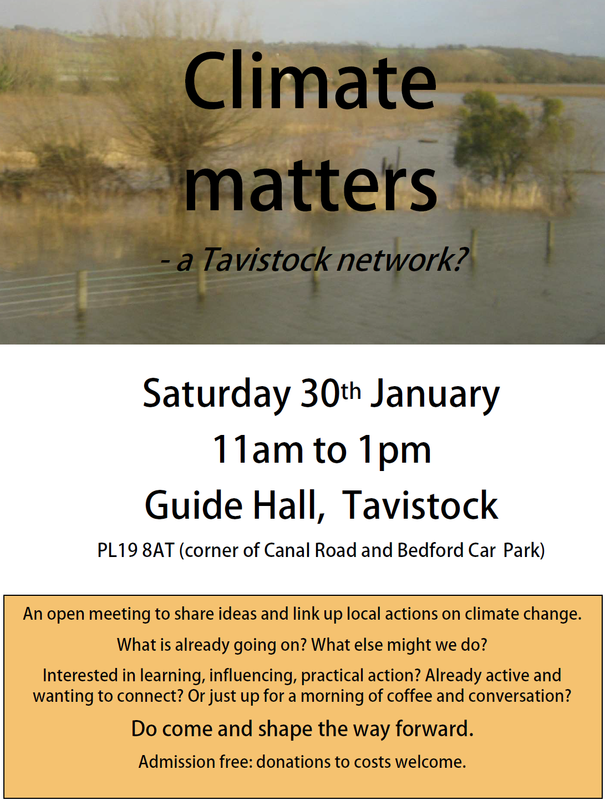 If you have any questions, ideas, would like to get involved please email info@transitiontavistock.org.uk. This entry was posted in Events/Meetings, News on January 23, 2016 by Transition Tavistock.